A latent image is an invisible image produced by the exposure to light of a photosensitive material such as photographic film. When photographic film is developed, the area that was exposed darkens and forms a visible image. In the early days of photography, the nature of the invisible change in the silver halide crystals of the film's emulsion coating was unknown, so the image was said to be "latent" until the film was treated with photographic developer. In more physical terms, a latent image is a small cluster of metallic silver atoms formed in or on a silver halide crystal due to reduction of interstitial silver ions by photoelectrons (a photolytic silver cluster). If intense exposure continues, such photolytic silver clusters grow to visible sizes. This is called printing out the image. On the other hand, the formation of a visible image by the action of photographic developer is called developing out the image. "Printed out" image on a 35mm B&W film, overexposed by approximately 24 stops (about two days of exposure at f/2), without any chemical processing, showing that the silver clusters can grow up to visible sizes without developing. The size of a silver cluster in the latent image can be as small as a few silver atoms. However, in order to act as an effective latent image center, at least four silver atoms are necessary. On the other hand, a developed silver grain can have billions of silver atoms. Therefore, photographic developer acting on the latent image is a chemical amplifier with a gain factor up to several billion. The development system was the most important technology that increased the photographic sensitivity in the history of photography. Philosophy (from Greek φιλοσοφία, philosophia, literally "love of wisdom is the study of general and fundamental problems concerning matters such as existence, knowledge, values, reason, mind, and language. The term was probably coined by Pythagoras (c. 570–495 BCE). Philosophical methods include questioning, critical discussion, rational argument, and systematic presentation. Classic philosophical questions include: Is it possible to know anything and to prove it? What is most real? Philosophers also pose more practical and concrete questions such as: Is there a best way to live? Is it better to be just or unjust (if one can get away with it)? Do humans have free will? A few days ago I was walking on West Broadway with my friend Bob Mercer (publisher, writer, editor, art director, designer and now a musician [not of note he admits]) when we passed by a Westender box at a corner. The paper itself was announcing its imminent demise. I said, “It is the end of journalism in our city.” Mercer corrected me by saying (I cannot remember his exact words) something like, “It is the end of ad generated journalism.” In the 80s we used to call this advertorial stuff “service pieces”. This left me in a quandary in that I do not quite agree with him. By the end of that day I was looking at all my philosophy books and came to the conclusion that just like the ancient Greeks did not put stuff into categories (blame that later day Aristotle for that) they considered philosophy to be the study of knowledge. In the same way the Greeks did not subcategorize the arts. My conclusion is that any consideration in one’s mind of a problem or element of existence is philosophy. In this was a film, a poem, a piece of visual art can all be philosophy. The Pre-Socratic philosophers speculated on the origin of our world and a universe. They like Democritus came up with the idea of atoms. And Zeno of Elea with this tortoise/rabbit paradox predicted the Newton/Leibnitz discovery of the calculus and the infinitesimal (with its own asymptote). 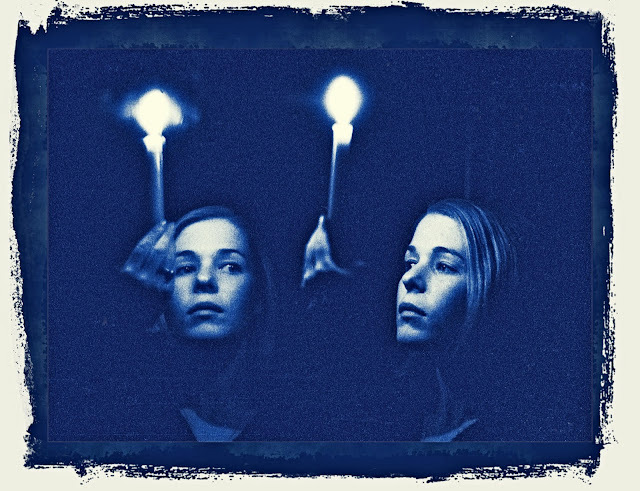 Which brings me to this double image (I used a mirror) in my 1964 photograph of my one sided (my side) relationship with the enigmatic Judy Brown. The image here that I have scanned a few minutes ago is the first time that it has seen the light of anything except from former times when I might have looked at the negative and decided not to print it. And I never did print it. The magic of the darkroom (alas I have one no more!) was opening my Nikor tanks and to look at a reel of developed b+w film and seeing images. It was and still is magic for me. More magic happened when I would place my exposed photographic paper into the developer and the image would slowly emerge from a blank white sheet. In the 19th century the image of a negative (be it photographic paper, a glass plate, a coated silver plate, and that newfangled nitrate and acetate plastic) was called a latent image. In short this meant that the image was there (unseen) and just needed to be “developed out”. Digital photography with the instant viewing after the fact in the back of a camera is simply a more efficient version of Edward Land’s Polaroid. It was only recently that I accidentally touched a button and the screen of my Fuji X-E1 showed me the time of the exposure and the camera settings. I have been told that some cameras will even give the precise location via GPS. With all that out of the way I look at my image (I prefer the word photograph and eschew that terrible capture) and think that Judy was alive when I took the photograph. Ample proof of this is my photograph. I have no idea where she is now or if she is alive or dead. But somehow looking at the photograph she is as alive as I am right now. Is she alive in that photograph? What is existence? Does the intelligence in her eyes reveal a spiritual (not a Democratic atomism) ether that has no material substance? What is nonexistence? If I have no memory of our verbal interactions at the time of taking the photograph is this a failure of memory? Mr. Mercer, I believe that philosophy is alive and well within me. If this is the case I can subjectively surmise that it is alive and well within others as long as they question their own existence.